Kanha Tiger Reserve remains open for visitors from October 16 to June 30. However, it is the discretionary power of park management to change dates, entrance timings, rules, facilities without prior notice. 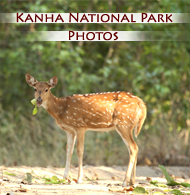 Inside Kanha Park India, Game drive or Park Safari is allowed in the morning and evening time only. Exact timing vary with the season or change in sunrise/sunset timings. Winter season prevails from November to February during which temperature ranges from 1° C to 28° C.
Summer season generally prevails from March to June during which temperature ranges from 28° C to 44° C.
Best time for Wild animals & Tiger sighting / photography is from February to May months. Best time for Tiger sighting is early morning. Best time for reptile sighting in Kanha Tiger Reserve is May - June, when monsoon approaches. In rainy season, they seems more often. Best time for Sloth Bear sighting is months of Feb - March - April when seasonal fruits like Indian Butter Tree fruit (Local name=Mahua) are available in abundance. Reserve accommodation in advance to avoid problem during peak season (December end). Number of private & government wildlife resorts & lodges of every budget category are available close to entrance gates of Kanha National Park i.e. in Khatia gate & Mukki gate. Privately operated or resort owned/attached, open 4x4 gypsys/jeeps are available for park safari. Wear clothes of colour matching with surrounding (forest-green & light brown)as it will not disturb wildlife during safari. Carrying binoculars and good quality camera will be an added advantage during park safari, especially during bird watching safari tours. Be at the entrance point at least 30minutes before the opening time as due to que of safari vehicles, entrance formalities likely take sometime. During winter season, morning time is very cold. As safari vehicles are open so it is recommended to wear/carry warm clothing like gloves, woolen caps, sun-glasses etc. Follow instructions & guidelines of accompanying guide/naturalist. On any confusion consult available guide/naturalist. Carry enough cash/local currency during visit as national parks are in remote areas and ATM facilities are often not available near-by areas. National park entrance charges, guide fees are fixed and managed by forest department where as Jeep safari charges are managed by Jeep owners. Wildlife Safari charges, charged from tourist is combination of Safari Jeep rent, Government Entrance charge & Naturalist fee. Avoid free roaming in deserted & lonely places outside resort campus especially during morning & evening time and follow guidelines of resort management to avoid inconvenience.